The Giant Sea Scallop (Placopecten magellanicus) has long been an important market for Maine’s commercial fishing fleet. Following a sharp decline in catches, landings have increased in recent years, and there has been a concurrent recognition of the premier quality of Maine scallops, with ex-vessel prices rising sharply over the last several seasons. 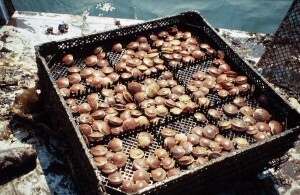 In 1999, with support from the Federal Government and the Maine Department of Marine Resources, the Maine Aquaculture Innovation Center organized and led a study mission to Mutsu Bay in Aomori Prefecture, Japan, where the Japanese scallop (Patinopecten yessoensis) is intensively grown on longlines and on the seabed. The 35-page report on the trip may be ordered from the MAIC office. This report has sparked the interest of commercial fishermen and would-be scallop farmers. 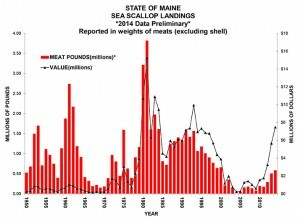 By the fall of 1999, several research projects had begun to determine if Japanese scallop spat collection and husbandry methods could increase scallop production in Maine. Collaboration with Japanese scientists is continuing. Presently, there are several shellfish farms in Maine that are producing sea scallops, with an active program of research, product development and supportive regulatory policy. Production is currently centered around bottom cage techniques, but investigations into the use of the ear-hanging technique are also ongoing. Strong opportunities exist in meeting the market demand for meats (the adductor muscle of the scallop), as well as items such roe-on and live scallops. Challenges exist with respect to affordable testing for biotoxins from harmful algal blooms, and refining husbandry techniques.